IT’S NOT SURPRISING THAT ON ITS SECOND DAY OPEN FOR LUNCH, San Francisco’s Little Gem has a line out the door. 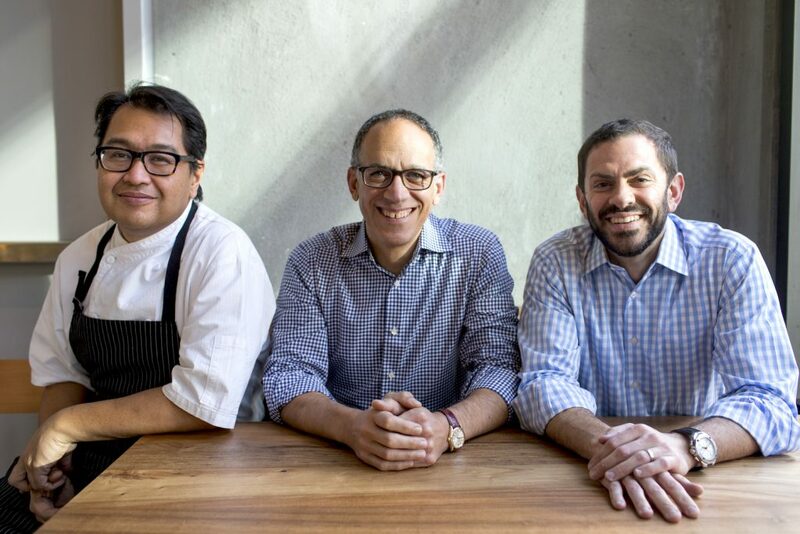 In this town, a new restaurant opening can be as exciting, and as well attended, as a movie premiere, especially when alums of the prestigious Thomas Keller Restaurant Group play starring roles. Only this Hayes Valley spot is not a white-tablecloth, multicourse, two-month-waiting-list affair. It’s a bright, upscale café with counter service and fresh, seasonally influenced breakfast, lunch, and dinner menus that also happen to be free of gluten, dairy, and refined sugar. A beacon of clean eating and a weather vane of trends to come, Little Gem showcases something little known but absolutely true about allergen-free cuisine: if you’re cooking with quality, whole ingredients, the finished product is not a less-than version of something that would otherwise be wonderful—it’s farm-to-table delicious. With business partners chef Dave Cruz, previously of famed restaurants Nobu, Bouchon, and Ad Hoc, and ex-Wall Streeter-turned-sustainable-food-champion John DeFasio, Eric is redefining restaurant food by proving that clean, healthy, environmentally responsible eating and refined, upscale cuisine don’t have to be in opposition. Within his open kitchen with street-facing picture windows, chef Cruz crafts pristine salads from ripe, top-notch, farm-fresh produce—perhaps endive, spinach, blueberries, and avocado with a barely there honey-citrus vinaigrette. His entrées are founded on the honest, gorgeous flavors of roasted vegetables, slow-cooked heirloom beans, and lovingly prepared wild fish or sustainably farmed meats. Dinner specials are a combination of soups, salads, chef’s choices, and design-it-yourself “market plate” selections of vegetables, grains, meat, and fish. Throughout, it’s pure flavor, literally and figuratively. Of course, some culinary magic has to happen to create items like the DF yogurt for the breakfast parfait or the GF/DF crepes, which encase roasted vegetables or almond butter and homemade jam. And it does. The yogurt, made from coconut milk, is impossibly creamy, tangy, and irresistible, while the crepes, ultrathin, pliable, and slightly reminiscent of mochi, are a revelation for anyone in search of a GF way to elegantly wrap entrées or dessert fillings. Meanwhile, the velvety and intense lemon custard and chocolate pudding are so spectacular, they beg the question why anyone needs to cook with refined sugar at all. If you’re Dave Cruz, you apparently don’t. But he’s not the only one redefining dining expectations and cooking guidelines by proactively addressing the needs of our over-stressed bodies and planet. In late 2014, Alain Ducasse, one of France’s most notable chefs, unveiled a lighter, vegetarian-focused menu at his flagship restaurant that promotes consuming “more ethically and equitably.” Toward the end of 2015, chef Dominic Teague, of London’s top-ranking Indigo restaurant, turned his menu GF and DF without even mentioning it—and later said that no one noticed the difference. 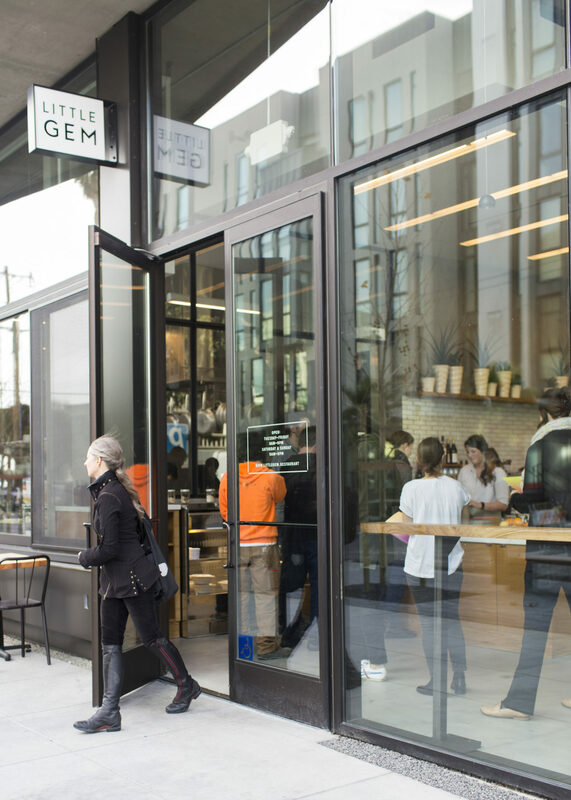 But Little Gem’s allergen-free concept marries the convenience of fast-casual eats with the technique and detail of fine dining. The fact that the crowd filtering in and out of its airy space may not know the menu is squeaky clean is inconsequential. If they’re coming for good food, they’ll get it. Get a print or digital issue of GFF’s spring 2016 issue, which features more gluten-free, dairy-free recipes from Little Gem!